Wow! 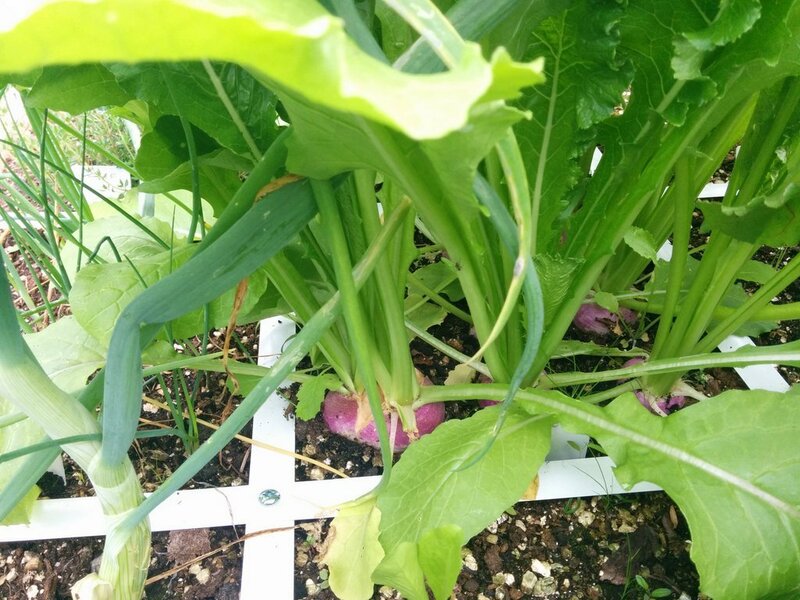 I had decided to not plant parsnips because I didn't want to bother with a topper, but that icicle radish has convinced me to use an empty square for parsnips. Woo Hoo! TD, excellent. So tell us, do you like SFG? sanderson ... I'm lovin' SFG. There's so much stuff growing in those boxes I'll probably have to give some to the neighbours! I'm growing things that I have not tried to grow for years. I'll be firing up the Vitamix blender this week to make some garden fresh smoothies from some of those SFG veggies. It will be interesting to see what happens now that I don't have a chicken wire cage over one of the SFG boxes. I expect the neighbourhood rabbits are going to get themselves some fresh salad as they hop by the SFG box. I may have to build a fence around boxes instead of using the cages. I wouldn't say it was a jungle, Trolley, just a lovely pile of healthy looking veggies. You really are doing well. Tad envious, but you've worked for it. A further update on my SFG following a 12 day absence during which it took care of itself. I've not yet checked with the neighbour to see if she did any watering for the SFG. I think there was enough rain to make the need for watering unnecessary. 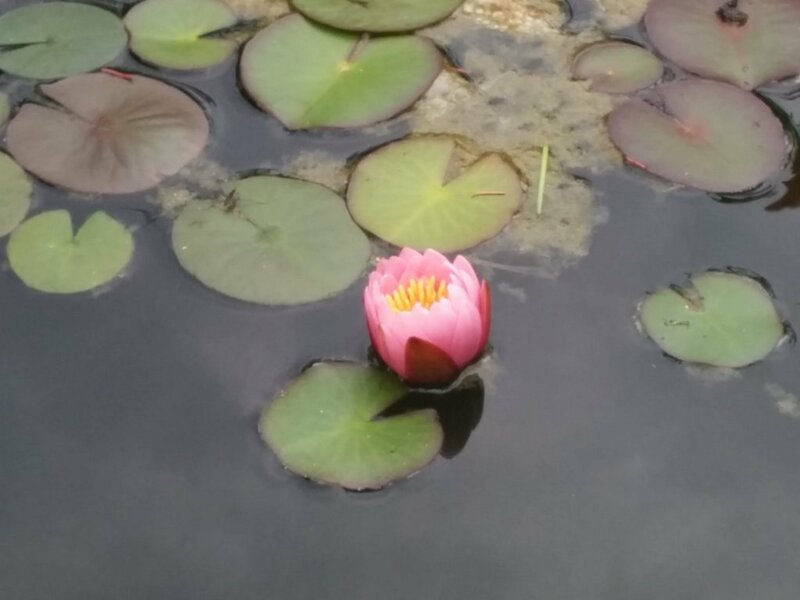 We have our first water lily flower starting to open up. This is the beets square. Looks like the one on the front left has split. This is one of the icicle radishes still in its square. The roots are pushing the top of the raddish out of the Mel's Mix. It may better to have a top hat on this square. Another view of the radish square. 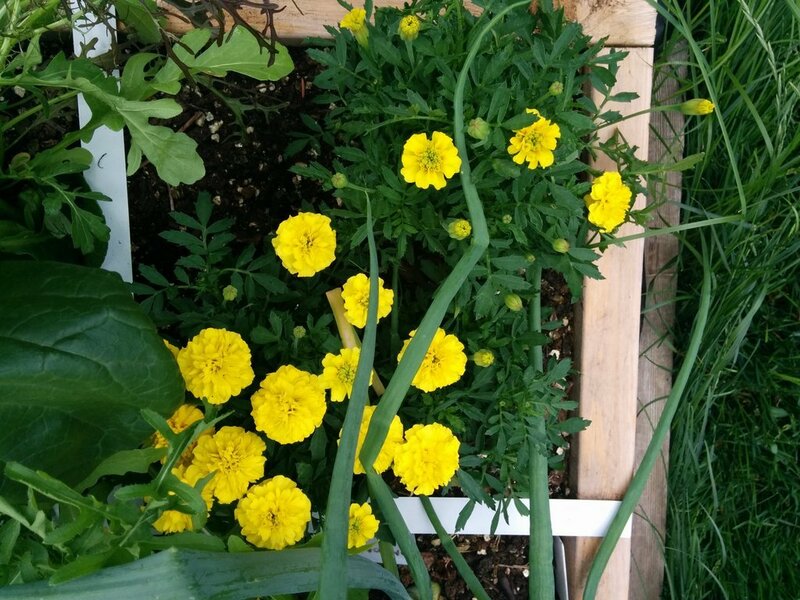 These are the marigold plants that I almost killed from over watering and/or frost at the start of the season. They have recovered well. Here is our parsley jungle. I can't believe how much this grew while we were away. I don't know what to do with all this parsley. Here is the cilantro jungle. Same comments as for the parsley square. 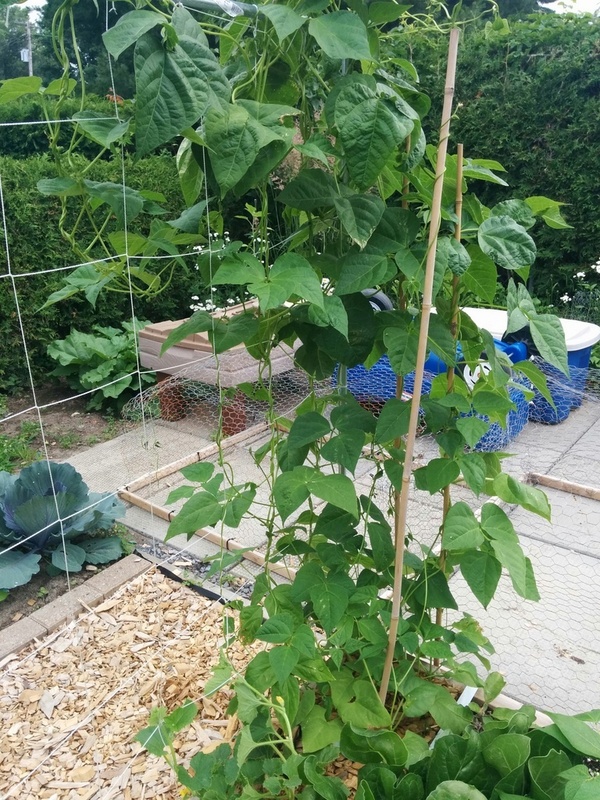 Pole beans are doing OK. Looking good. Parsley and cilantro can be dried for cooking. I'm overwhelmed by all the things that have grown in my SFG boxes. There is so much. There's all these beautiful green tops from the radishes and turnips not to mention the carrot tops and the swiss chard, etc., etc. 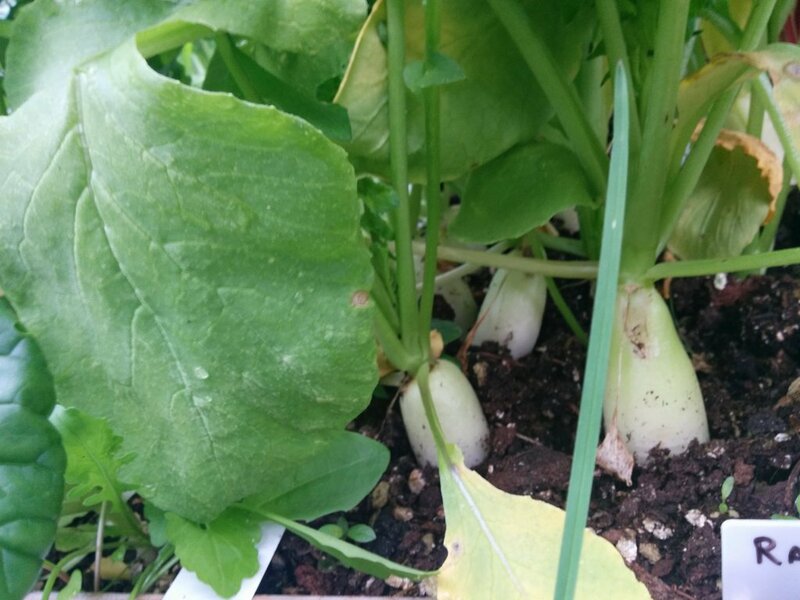 Then there are the radishes and turnips themselves. I don't want to waste anything but I am over my head as to what to do with some of the things. I'm hoping Mrs. TD will help with using them in meals. I do some cooking but I keep to simple dishes, mainly stir fries. Your garden looks better after you've done nothing to it for ten days than many people's gardens do when they dote on them daily. Do you know anyone who has chickens? They love the tops and scraps from root veggies, and it can be such a healthy variation in their diet. My neighbor will take most any scrap I have except potato peels, I think. 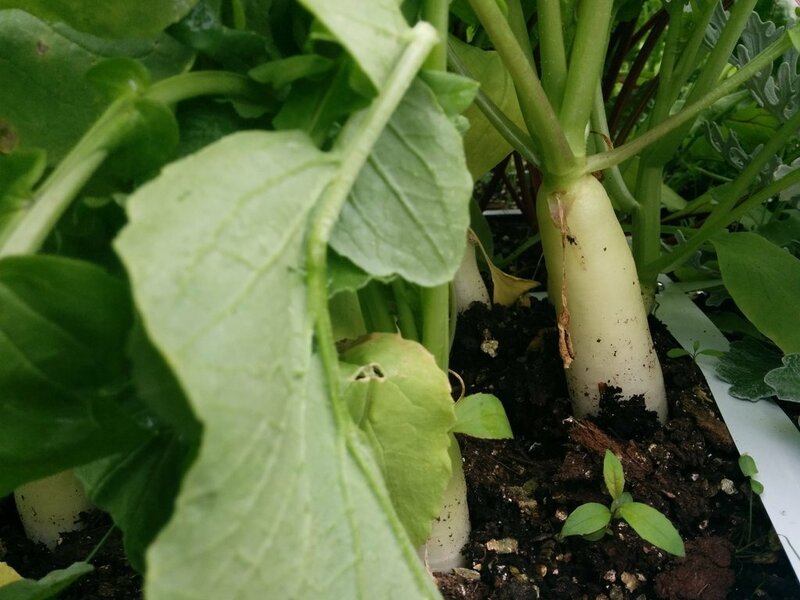 I've read that radish tops can repel some insects, so maybe there's a use for those in your garden? As a spray or mulch? Thanks folks for the kind remarks and suggestions. I decided to cut back my cilantro and dry the leaves. 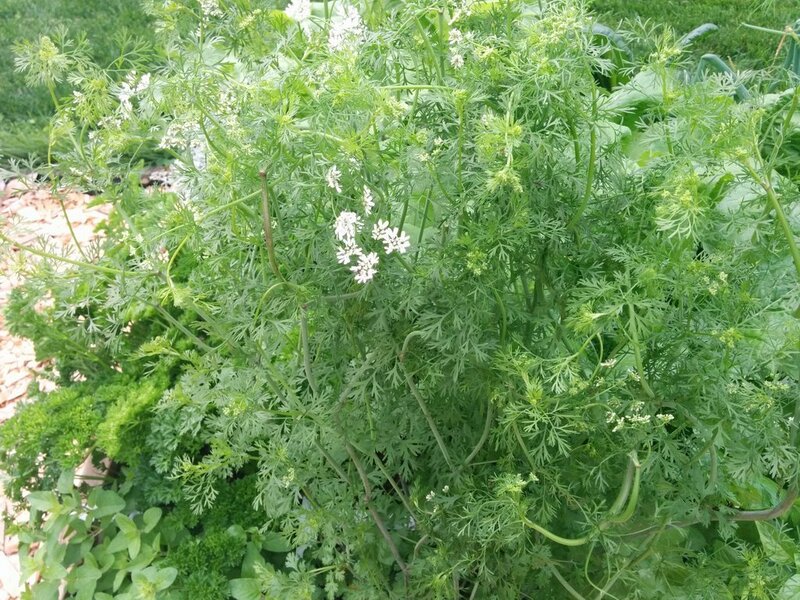 However, after doing some research on the web I realize that the cilantro has bolted and gone to flower which means (according to those web sources) that the leaves have lost their flavour. As well, I could have let the plants go to seed and then harvested the coriander seeds. Question: does harvesting the beet greens affect the root development? I haven't done the greens harvesting, but am about a week from beet root harvest. When I pull the roots, then I assume the greens can be cooked. Any recipes? I have quite a bit of Swiss Chard, and they are similar, I believe? TD, The cilantro looked like it had bolted/gone to seed, but the cilantro aroma is still good. Have you tasted the leaves? I let mine go as the bees seemed to love the flowers, then I saved the seeds as coriander. Sanderson ... Yes, the main leaves still have aroma. I have not taken out the plants completely. I just cut off the stems that had bolted but I expect the plants will not last long in the summer heat. I'll harvest them soon. 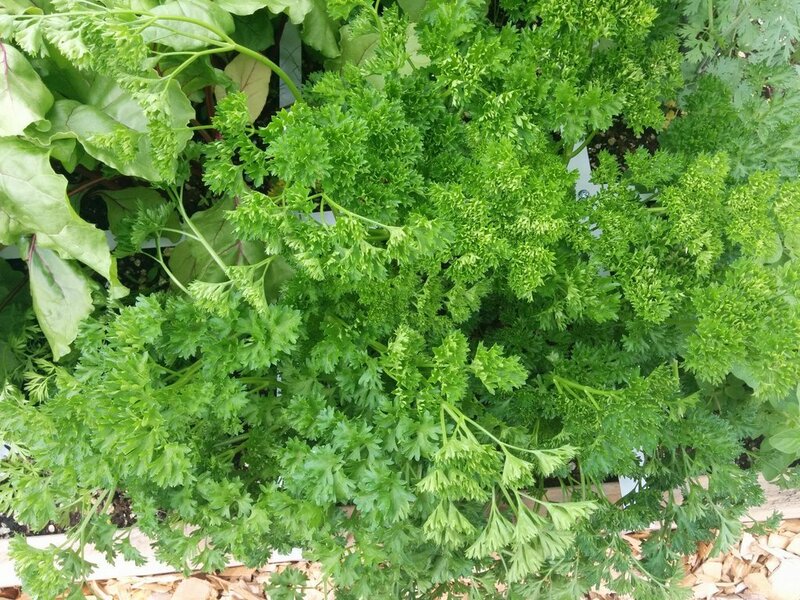 I have some other cilantro plants in my non-SFG garden that I will allow to go to seed. BTW ... Mrs TD does not like cilantro. She is in good company because Julia Child did not like it. Maybe Mrs TD likes the taste of the bolted cilantro? It changes somehow as it becomes coriander. We like it both ways though. I put the flowers and fine leaves into salad and stir frys. Yesterday was a bit of downer. I went to my osteopath for some therapy for my BPPV. While in his office I suffered a bad attack of vertigo. It seems to last for a long time but it was actually only a few seconds. I never feel 100% after one of those situations. Today is a new day and it's an absolutely beautiful morning here in Ottawa Canada. I got up and did about twenty minutes of exercises then jumped on my bicycle and went for a 5 Km bike ride. We have some nice bicycle paths in the area so for the most part I can avoid busy city streets. I ride a bike even though at times I have vertigo ... am I crazy? I can pretty well tell in advance what body/head motions will bring on the vertigo (e.g., quickly turning over when lying down). When I got home from the bike ride, it was time to make a green smoothie. It was wonderful to be able to go to the SFG and pick the necessary fresh greens (carrot tops, swiss chard, beet tops, turnip tops, etc.) for the smoothie. My wife didn't like the taste of this morning's smoothie so most of hers got poured onto the compost pile. I thank the Lord for this day. Glad you are feeling better today. Here is part of this week's harvest. 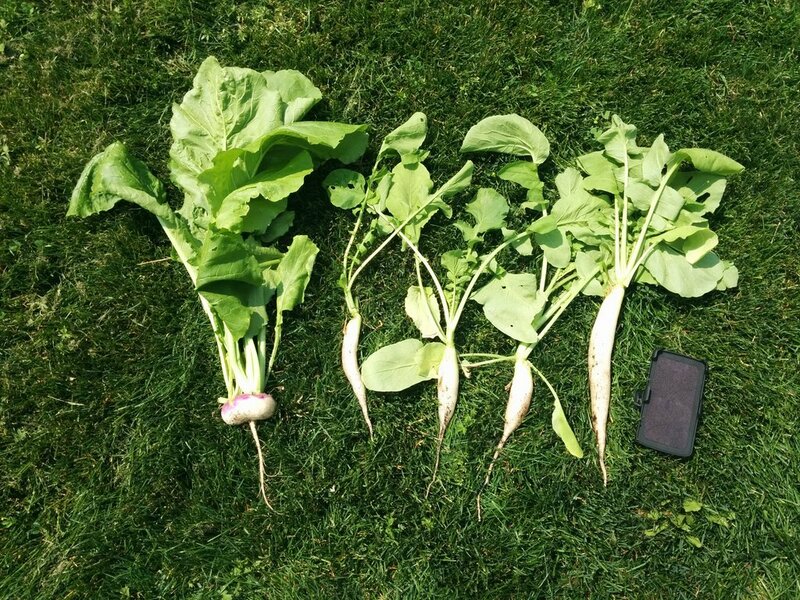 The radishes did well (note the smartphone case next to one of them for comparison). The turnips are rather small but delicious. Everything has lots of huge leaves which may not be a good sign for root crops. Turan ... I have been throwing them into the Vitamix blender to make smoothies. Your recipe sounds interesting. Tks. @sanderson wrote: Glad you are feeling better today. Ditto. I'm scared of heights and have had flashes of vertigo, which are pretty unnerving, but it's hard to imagine being overcome by that sensation on anything like a regular basis. Glad you're feeling better today ... though my first thought was certainly ... Whaaa? Someone with severe vertigo rides a bicycle? That sounds like just begging for trouble! Maybe I should wrap myself in bubble wrap when I ride the bicycle! TD, I was thinking the same thing as Marc! Hopefully you wear a helmet? Do you have a "Help, I've Fallen" GPS tracking device? Don't mountain climbers have something like that so the park rangers can locate them? Or, am I just over concerned? sanderson ... I always wear a helmet when I bike ... don't leave home without it. I don't have the GPS but I should make sure I have a cell phone with me. I know it sounds stupid that someone with vertigo would attempt to ride a bicycle. Actually today was the first time out on the bike for a while. As an alternative, I have been using the stationary bike in the house and I don't have far to fall off that. My son and his family will be visiting on Saturday and I love to go cycling with my seven year old grandson; but his sudden maneuvers and stops may make things interesting. Could you actually fall off a stationary bike, or would you be able to just hang on tight and lower yourself down? Marc ... I was just kidding about falling off the stationary bike. I think it would be possible to just hang on until the wave of vertigo settled down. As mentioned before I have a good idea what body positions will bring on the vertigo. Up to now, when I have an attack (i.e., I feel like I am spinning and out of control) it does not last long but I feel the after effects for hours (e.g., some lightheadness, anxiety about getting another attack). Yesterday was the best day I have had in weeks and I pray today will be another good one. Maybe my body is adapting the problem.